DON’T FORGET: My last trade alert (ITMC), from Wednesday’s 3/15 trading session, was a substantial winner for Small Cap Firm members! ITMC provided traders with MULTIPLE intra-day potential gains on Wednesday and traded more than 18x its 30-day average volume. ITMC opened at $0.116 and hit a high of $0.131 – That’s a +12pct move up. Then ITMC retraced to $0.10 and BOUNCED BACK UP to $0.13 before noon! For potential intra-day gains of at least +30pct! It finished Wednesday’s 3/15 trading session @ $0.12. That’s also a +20pct move up from Wednesday’s low of $0.10! These types of swings happened numerous times during Wednesday’s 3/15 trading session with ITMC. Congrats to everyone who followed and profited from my alert on ITMC Wednesday last week. NOW TURN YOUR FULL ATTENTION TO MY NEW MULTI-DAY BIOTECH PLAY. **CMXC** Has Been In Full BREAKOUT Mode Since The Beginning Of March! (CMXC) Has A SENSATIONAL BULLISH CHART That Has Made Historical RUNS UP In The Past. Valuation is currently just 19pct lower than its 52-week high. If (CMXC) can continue its current upwards trend this week; Traders could be looking at inescapable NEW HIGHER HIGHS. 1.) On September 9th, 2016 (CMXC) opened @ $0.137 and SKYROCKETED to a HIGH of $0.299 on October 12th. That represents a MEGA RUN of +118pct in a straight month! 2.) On January 4th, 2017 (CMXC) opened @ $0.15 and FLEW to a HIGH of $0.4051 on January 10th. That represents a MONSTER RUN of +170pct in just 5 trading sessions! 3.) THE MOST RECENT BREAKOUT: On March 8th (THIS MONTH), (CMXC) went from a low $0.23 and hit a high of $0.37 on March 16th. That’s a strong double digit move of +60pct in one week! REMEMBER: CMXC Is Not Just Our Typical Day & Swing Trade Alert; CMXC Is A SOLID MULTI-DAY Play That Could Provide Traders With Substantial Potential Profits In The Coming Trading Sessions! Start Your Research On BIOTECH Ticker **CMXC** Immediately. This MULTI-DAY BIOTECH Trading Idea Is Loaded With Potential Luscious Short-Term Gains RIGHT NOW. 1.) The 9-Day RSI is extremely bullish right now @ 54. This firmly suggest that shares of CMXC still have plenty of room to run further north. 2.) CMXC is sitting near firm support levels at its 20-day MA of $0.2945 and 50-day MA of $0.3009. 3.) Barchart.com has given CMXC an 56% OVERALL BULLISH rating! 4.) StockTA.com has given CMXC a BULLISH rating just for the short-term! Can This Breakout Chart Keep On Trucking? A bullish engulfing pattern is a chart pattern that forms when a small black candlestick is followed by a large white candlestick that completely eclipses or “engulfs” the previous day’s candlestick. The shadows or tails of the small candlestick are short, which enables the body of the large candlestick to cover the entire candlestick from the previous day. As implied in its name, this trend suggests the bulls have taken control of a security’s price movement from the bears. This type of pattern usually accompanies a declining trend in a security, suggesting a low or end to a security’s decline has occurred. However, as usual in candlestick analysis, the trader must take the preceding and following days’ prices into account before making any decisions regarding the security. 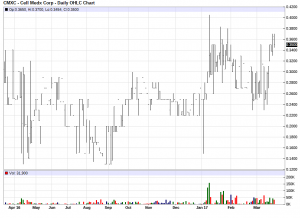 As You Can See… (CMXC) Is Presently In Extreme BREAKOUT Status! I Almost Forgot To Mention That This BREAKOUT BIOTECH Company Has +$378k In Total Assets – Up More Than $100k From Last Year! Cell MedX Corp. is an early development stage company focused on the discovery, development and commercialization of therapeutic products for patients with diseases such as diabetes by developing technologies to help manage the illness and related complications. The future of healthcare is a renewed priority and is dedicated to helping people stay healthy. Emerging practices and technologies are being used to detect and treat medical problems sooner and all with the ultimate goal of achieving better health outcomes. Traditionally, healthcare has evolved around treating illness with chemical (pharmaceuticals). However at Cell MedX, they have expanded the management of difficult chronic illnesses like diabetes to encompass electro-chemical methods of treatment and are achieving exceptional results. Technology To Treat The Body By Improving Its Electrical Function. Many universities are still teaching that life is based on a chemical model. Given the explosive growth in electrical technologies and our ever increasing understanding of physics, it is more realistic in the 21st century to view biological processes on an electrochemical basis rather than on a chemical basis alone. What may seem like a subtle shift could have major implications for the healthcare industry. The growing aging population worldwide, the increasing number of people with chronic conditions, expanded regulatory requirements, insufficient healthcare resources, and rising costs are all burdening today’s health system, and creating the impetus for major changes. Everyone knows they should have a healthy lifestyle, but knowing what to do and which tools to use can be overwhelming. Patients can now manage diets, medications and health goals much easier. In addition, social networking sites enable people to connect with others with the same medical issues to discuss options and available resources. Combining this knowledge with the creation of effective medical devices now puts healthcare in a new medical context that is direct-to-consumer wellness. At Cell MedX they are at the leading edge in the development of devices that treat chronic and acute conditions for both clinical and self-management care. They are pioneering safe, results oriented technologies combining electro-chemical applications and establishing new levels of treatment, known as cellular medicine. The concept of using microcurrents to treat the complications that arise from diabetes is truly a novel concept. In the past, microcurrents were used almost solely with the purpose of helping to relieve pain. Through advancements in microcurrent technology, Cell MedX has developed the eBalance Pro, specifically designed to assist diabetics in controlling blood glucose fluctuations and maintaining steady blood glucose levels. With the eBalance technology, Cell MedX is attempting to move the treatment of diabetes away from purely pharmaceutical solutions. combined solution that treats the human body as a complex bioelectrical system and thus promote self-healing. Diabetics now have the opportunity to help repair their bodies at the cellular level rather than merely mask their complications with potentially damaging pharmaceutical drugs. Cell MedX is now shipping eBalance Pro devices to healthcare practitioners around the world to allow physicians to get a first hand look at the potential benefits of treating their patients with microcurrents. Cell MedX is also in clinical trials in an effort to seek medical approval from government bodies in Canada and the US. To compliment the Pro model, Cell MedX is in the process of developing the eBalance Personal device that will allow patients to bring the powerful eBalance technology into their homes. The Personal model is presently in the research stage and will be available to the public in 2017. CARSON CITY, NV / ACCESSWIRE / March 9, 2017 / Cell MedX Corp. (CMXC), (“Cell MedX” or the “Company”), is pleased to announce that Dr. Richard Tytus, the Lead Investigator on the previously announced Observational Clinical Trial (the “Trial”), and his team at Hamilton Medical Research Group have commenced screening for qualified subjects. The group of seven potential study participants have been screened with an additional five subjects scheduled for screening. Three subjects have qualified for participation in the study and two more are pending qualification based on receipt of their bloodwork. It is expected that additional subjects will be enrolled over the next two weeks. The intent of this Observational Clinical Trial is to assess the impact of three months of eBalance therapy as an adjunct treatment, on HbA1c in Type 1 and Type 2 diabetics. The Trial is being conducted over a four to six month period enrolling a minimum of 30 individuals who will receive three months of eBalance therapy. All study participants will be screened to confirm a diagnosis of either Type 1 or Type 2 diabetes. There’s plenty of firepower to get deals done. The 14 biopharma firms with the most cash had more than $220 billion in cash and marketable securities on hand at the end of the third quarter and can raise plenty more in debt on top of that. Sluggish near-term sales growth adds to the motivation for many firms to act. And though AbbVie Inc. is expected to produce stellar sales growth for the next few years, that will be almost entirely on the back of one drug, Humira. If a series of legal disputes don’t go its way, then that drug could face competition sooner than expected. AbbVie has been one of the biggest spenders in the past two years, but it’s a candidate for even more M&A. Caution is still warranted, and not every potential target is a gem. Sanofi wasn’t exactly being applauded for its potentially expensive pursuit of Actelion; its shares fell 4 percent after Johnson & Johnson briefly dropped out of the fray and rose once J&J returned as the exclusive bidder. But with so many firms having a perfect combination of cash and need, expect caution to fly to the winds in 2017. Start your research and due diligence on CMXC immediately. Get ticker (CMXC) front and center on your trading screen for Tuesday’s 3/21 trading session.